Some vegetables take less effort to get kids to eat than others. While brussel sprouts and lima beans might not always be favorites of your little ones, I bet carrots are a pretty easy sell. For starters, they're not green, a color most kids associate with their veggies. And along with being naturally sweet, carrots are a gold mine of nutrition and a great source of beta-carotene. Beta-carotene converts to Vitamin A, which is essential for good vision. Still, some kids will avoid vegetables at any turn. The fun part of this recipe is turning carrots into something they won't be able to say no to. 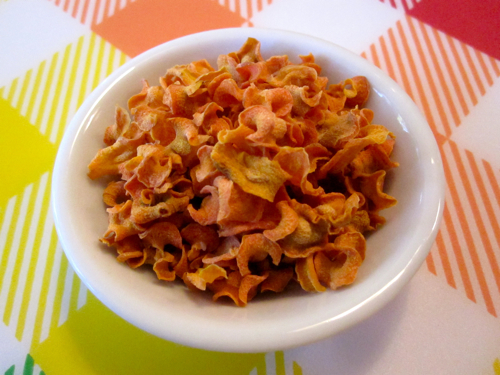 These carrot chips couldn't be easier to make and they are so delicious and fun to eat, you'll likely find yourself running back to the market for more carrots for the next batch! Best of all, they are a great way to get kids to eat their veggies, and that should make every mom happy. 2. Using a mandoline or a knife, thinly slice the carrots into rounds. 3. Place the carrot chips on a silpat or parchment-lined cookie sheet, sprinkle lightly with salt and bake for 45 minutes. If this actually gets my son to eat a vegetable that isn't deep fried I'll (1) fall over in shock and (2) be eternally indebted to you!!! Did you cut your carrots in rounds? They have such a fun shape- it doesn't look quite like circles. Yes, they are cut into really thin rounds, they shrivel up when they bake. They are so addicting! This sounds great! I just wonder if it would be ok to give to a toddler without posing a choking hazard. What do you think? These are great for toddlers, they are thin and crispy so there shouldn't be a problem. Kenya loved them! I made these for my 18-month-old yesterday. They really shriveled up into barely-there sorts of crisp/chewy chips. I think I used about 5 decent-sized carrots and ended up with about a cup of \"chips.\" Anyway, he ate them up -and he's not really crazy about carrots! I definitely recommend them for toddlers. It looks like they were peeled with a veg. peeler - can I do this or would it makes the slices too thin? I used a mandolin to slice them , I will post the link on the page. I used regular full size carrots. They wouldn't be good for freezing though. They were gone after an hour, thats how good they were! Seems to me like she used whole carrots. Doubt 4 baby carrots give you as much as is shown in the picture. Plus baby carrots are a pain to slice! You didn't need to toss the carrots in oil? I've made kale chips and have had to toss them in olive oil before baking. No you don't -- thats what make this recipe so easy and healthy! Let us know! I never tried parsnips!! I hoped these would be a hit, but they weren't with my 4 year old. I wonder if they were more crispy if she would like them better. Would more time in the oven dry them out more and make them crispier? I would just like to say that I think you and your recipes are AMAZING! Not only does my 2 1/2 yr old daughter love your recipes but many of them are good for the Weight Watchers plan as well! This one is in the oven right now! I can't wait to try them! I made these with both carrots and parsnips, and my extremely picky 2 1/2-year-old daughter snarfed them all down. Thank you! I just tried these and instead of using a mandolin, I used the peeler and made carrot strips. My problem is that most of mine burnt because I didn't watch them closely. But the ones that were not burn were perfectly crispy and delicious! I just made these. I needed to bake these for a total of 2 hrs and they came out nice and crisp. What other veggies could be used to make these? Just wondering! Love how she put this outfit toeeghtr! Love the colors, the bag, those shoes, love the layers, the swapped belts, love the orange ring! She clinched this one! So alive! HOT! I am about to try them for the third time. Mine stay chewy and I have a convection oven. I am going to keep going. DD has food intollerances and carrots are one of her few safe foods. I WILL GET THIS!~!! One other tip... be sure that none of the carrots are overlapping otherwise they may not crisp up. I did 250 degrees on convection (which would be 275 standard) &amp; they actually started crisping up at about 20 minutes. If they were a little more golden, they seemed to be crispy for sure; if still orange, chances were they might be a little chewy. I actually preferred chewy cuz it seemed a little \"al dente,\" but knew my kids would want just crispy, so I tried to bake most longer. I've got 2 relatively picky little ones (5 &amp; 2)...&amp; thanks to this site, they regularly eat kale (kale chips). We also do sweet potato chips &amp; I'm hoping to throw carrot chips into the mix. As picky as they are, like many kids if you make it into a chip, it has a better chance of ending up in their tummies! i can't wait to try these! i have a 1 week fruit and veg only detox. this is perfect because theres no oil and makes something crispy like chips with no guilt of eating them, ill check back later when i finish them! I have some big monster carrots in my garden and I decided to try this recipe. Instead of slicing the carrots into little rounds I cut the carrots in 1/2 then in thin slices length wise. I used my meat slicer. The chips were a lot bigger. I mixed them in with my beet chips and they made a beautiful colorful snack. I think slicing the carrots on the bias would give these a fighting chance at working. These are so ridiculously small, they look more like rabbit food than ever. Taste is completely \"meh\" for the perfectly cooked ones, chewy and gross for the underdone ones....at least the burned ones were crispy? I love carrots so I was excited to try this. I did everything according to directions, including using a mandolin. However, since you didn't mention a thickness I had to guess and I went with 1/8th inch slices. I'm expreriencing all of the problems others have described; looong oven times, chewy, very shriveled. I'm guessing a thinner slice would help and giving what setting you used would be very helpful. Skip the oven and buy them pre-roasted/pre-salted at Sprouts.